UPCOMING EVENT: Oceana Gold, Stop the Bullying! What: A rally to make some noise outside of OceanaGold’s Shareholder meeting! Join us in speaking out against OceanaGold’s bullying tactics in El Salvador and the Philippines. We need your help to make noise outside of their Annual General Meeting at the Fairmont Royal York. We won’t let them get away with suing countries that decline to give them mining permits (as they are currently doing in El Salvador) and illegally demolishing homes to make way for their toxic tailings ponds (happening in the Philipines)! Guest speakers will address harms perpetrated against communities in both countries, investor state dispute tribunals and the egregious actions of the company. 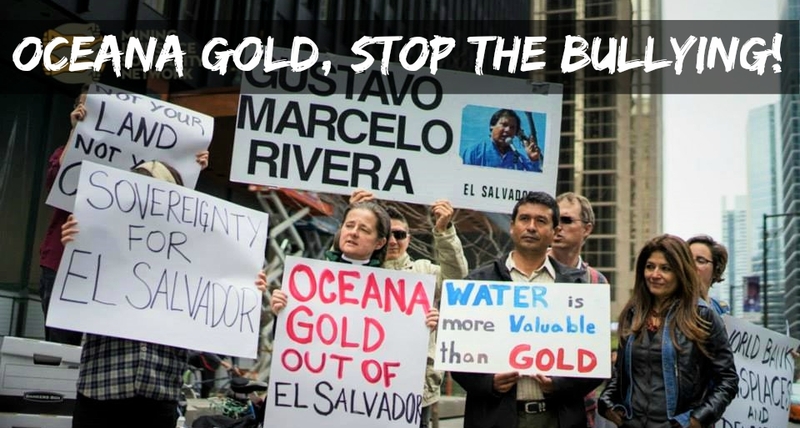 Help us send the message – OceanaGold out of El Salvador and the Philippines! Stop the Suit! Water is worth more than gold! This action is being convened by the Mining Injustice Solidarity Network, Council of Canadians, MiningWatch Canada, the United Church of Canada and others! Canadian-Australian mining company OceanaGold is suing El Salvador for US$250 million at a World Bank tribunal when the company failed to obtain a mining permit for which it never met regulatory requirements. As a result, over the past seven years, the tiny financially-strapped nation has been forced to divert over $12 million dollars from economic development, job creation and violence prevention, merely to pay to defend itself. Salvadorans have been very clear that they value their already stressed water supplies more than any gold mine. The risk to safe water is why El Salvador’s last three presidents and 80 percent of El Salvador’s population reject gold mining. Between 2009 and 2011, four local environmental activists were murdered in Cabañas. Since then, several local organizations have also received threats These crimes have never been fully investigated. Failing to respect the clear ‘no’ to metal mining, OceanaGold is bullying El Salvador with its suit while trying to get its foot in the door through the El Dorado Foundation. OceanaGold created this company-sponsored foundation at the local level in an attempt to rebrand the proposed mine. This is deceitful, disrespectful and dangerous. Meanwhile, in the Philippines, OceanaGold’s large-scale gold mining operations in the village of Didipio, Nueva Vizcaya province have also been the source of years of protest. Filipino organizations have been denouncing the illegal demolition of homes in 2008 to make way for the company’s tailings pond and contamination of the Didipio River and adjacent water bodies. Loss of water supplies, displacement and respiratory illness are among further complaints. Ignoring these persistent complaints, OceanaGold holds up the Didipio mine in its Salvadoran propaganda as some sort of example that Salvadorans should follow!